THE NEW ISUZU D-MAX UTAH V-CROSS WILL MAKE YOU V-HAPPY! Basically, as the SUV market continues to expand, SEAT want a part of it, which makes perfect financial sense. A little late to the games they might be, but judging by the photos, Aston Martin has made a significant stride towards their first SUV. Officially confirmed as being named DBX, the first development prototype is currently being put through its paces along a demanding Welsh Rally stage in the hands of the company’s Chief Engineer, Matt Becker. Though simulation is an essential part of DBX’s early development phase, this first prototype drive in Wales signifies the start of ‘real world’ testing. Further development mules will tackle some of the world’s harshest environments, from the frozen Arctic and scorching deserts of the Middle East to high Alpine passes and the high-speed demands of the German autobahnen and Nürburgring Nordschleife. I wouldn’t be surprised if they end up in Bolton too, as our roads are atrocious! This is a totally new world for Aston Martin, one that requires a dedicated test programme; one that features new processes, procedures and standards that reflect its all-purpose role. So, while it will perform with the verve and poise of a true Aston Martin, its dynamic envelope has to extend into areas previously off-limits to the marque’s sporting roots. Naturally this includes impressive multi-terrain and towing capabilities as befits a state-of-the-art SUV. The Volkswagen Amarok has always been a cut above the rest when it comes to premium features, comfort and refinement, as it says in the press bumf. And now, thanks to the introduction of a new special edition Aventura model, you have the opportunity to secure the keys to the most distinctive and luxurious Amarok ever. Cue the fanfare. Available to order from today, the Amarok Aventura features the ultimate specification list that combines striking design features with a host of creature comforts and safety systems. The Aventura features 20-inch Talca alloy wheels, body coloured sports bar with Aventura badging and chrome-plated side bars with step and LED spot lighting. Like all Amarok models, the Aventura is built to work and also features styling for under-body cladding, power folding mirrors and a protective coating for the load compartment. Customers can specify their Aventura in a range of colours and can also take advantage of a reduced price for special matt finishes. Available in either Ravenna Blue or Indium Grey, the matt paint can be specified as a £2,335 (ex VAT) option - a saving of 24% over the usual price. Also available are Mountain top roll covers made specifically for the Aventura model. Available in black or silver, they can be specified as an option for £1387.50 (ex VAT). Inside, the Aventura is positively bristling with equipment. ErgoComfort seats with 14-way adjustment are fitted as standard, and ensure that even the longest of journeys can be completed in total comfort. The seats are faced in soft Nappa leather, while the multi-function steering wheel is also leather-wrapped and is fitted with paddle shifts as standard. Volkswagen’s Discover Media Navigation system dominates the dashboard layout while special Aventura mats further enhance the feeling of exclusivity. To help keep drivers safe and secure in all conditions, the Aventura features a Lights and Vision package (automatic headlights with separate daytime running lights, Coming Home feature and windscreen wiper intermittent control with rain sensor) along with front fog lights with cornering function as standard. Powering the new Amarok Aventura is the Amarok’s most powerful 3.0-litre TDI V6 with 258 PS in normal driving and 272 PS when using the overboost function. The engine generates a thumping 580 Nm of torque between 1,400 and 3,000 rpm, while permanent 4MOTION all-wheel drive and an 8-speed automatic gearbox ensure that the Amarok can go where others fear to tread. The special edition Amarok Aventura is available to order through Volkswagen Commercial Vehicles Van Centres, priced at £39,960 (OTR exc VAT). For more details on Volkswagen Commercial Vehicles’ award-winning range of products and services, or to find your nearest Van Centre, please visit www.volkswagen-vans.co.uk. 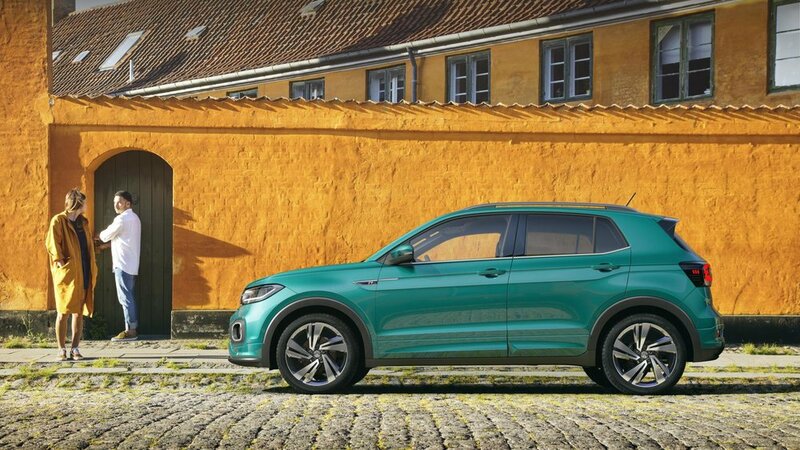 Volkswagen presents its new T-Cross, the company’s first small SUV, an urban crossover they say that sits between the Polo and T-ROC. Because it’s shorter than the T-ROC and more compact than the Tiguan, Volkswagen say that it’s better suited to the city and consequently they’re hoping that it will be a truly global success. With an overall length of 4.11 metres and a 2.56-metre wheelbase, VW say that there’s enough interior space for five people, though they don’t mention if all 5 people are 6-footers! For extra versatility the rear seats can be adjusted by 14cm allowing for either more passenger leg room or more luggage space which grows from 385 to 455 litres, or 1.281 litres with the seats folded flat. Engine-wise you’ll have a choice of four turbocharged variants: three petrol and one diesel. The two 1.0 TSI three-cylinder petrol engines with petrol particulate filter generate 70kw / 95ps or 85kw / 115ps. The top model is the 1.5 TSI four-cylinder engine with 110kw / 150ps. Completing the range is a 1.6 TDI four-cylinder engine with 70kw / 95ps. All engines comply with the latest Euro 6d-TEMP emission standard, of course. Standard equipment for the new T-Cross includes numerous driver assistance systems which were previously reserved for higher vehicle classes. Included as standard equipment are the Front Assist area monitoring system with Pedestrian Monitoring and City Emergency Braking System. That’s not all, there’s also Lane Assist, Hill Start Assist, the proactive occupant protection system, and the Blind Spot Detection lane change assist system with the integrated Rear Traffic Alert. Also available as options are the Driver Alert System, automatic adaptive cruise control and Park Assist. There are no dates or prices yet, but I reckon we’re looking at them being in the dealers around February 2019. … and I don’t mind admitting that I’m more than a little bit excited! Fancy a Mitsubishi Outlander PHEV for 24 Hours?